NARS and Specktra (if you are a NARS fan check this thread out as it also has images/info of the S/S collection, that bright orange lip pencil will be mine) are killing me with all the sneak peeks of the newest NARS collections due to hit the counters in the coming spring. Are you a fan of pinky peach and on occasion coral blushes? Of course you are and the NARS Final Cut Collection will more than please. 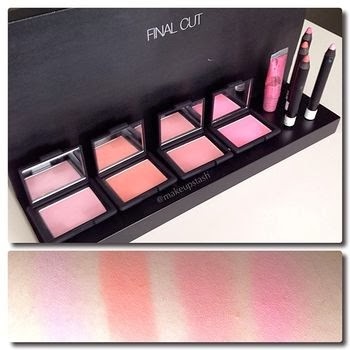 At the moment images have appeared on Instagram showing not only four new NARS blushes for the Final Cut Collection (may be to mark the brands 15th anniversary but that is not definitive) as well as swatches. Hiding in the corner of such image is what appears to be a pink toned skin illuminator and also four of NARS Lip Pencils I'm hoping they are matte or satin in formula as I'm not a massive fan of the gloss formula. At the moment only the blush shades are known but I do suggest following/joining the Specktra NARS Spring 2014 thread for any breaking news (trust me when I say these ladies know all the information before anyone else). Isn't NARS Spring 2014 shaping up to be rather wonderful? Information credit to Specktra - link. OMG!! The colours are so pretty! Ohhh wow they look so pretty! Love Nars. Oh yes peach pink and coral' love!! exciting!!!! looks amazing :) I want to know more now.